My favorite dessert of all time is ice cream. Even on birthdays, I would always ask my mom I want an ice cream cake instead of the plain ol' decorated big block of vanilla chiffon. 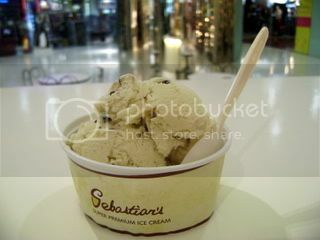 Everytime I go to The Podium, I have a hard time resisting Sebastian's Ice Cream. 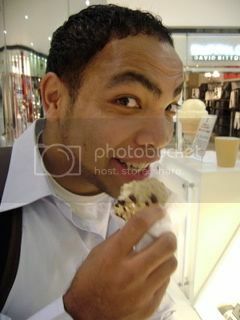 I love my ice cream very hard and cold (never liked soft-serve) and it has to be extra chunky. My favorite flavor is Chocolate Chip Cookie Dough. Yum! Second favorite is Mango Sans Rival. 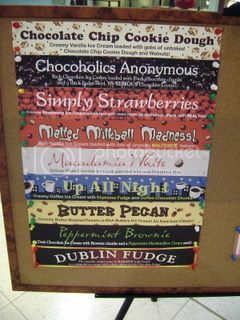 Here are the other flavors. The menu changes everyday. 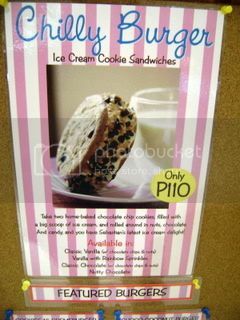 The newest product is the Chilly Burger -- ice cream sandwiched between 2 cookies. Robert is so cute in this picture. He liked it but his favorite here in Manila is still Penny Brown.